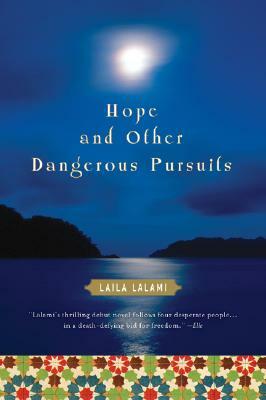 The author of Hope and Other Dangerous Pursuits, Laila Lalami, is a long-time blogger at the site originally known as Moorish Girl. I have followed her writing there for some time and have been looking for the novel locally for a while; I was very pleased, therefore, to come across it on my recent expedition to The Strand. It doesn’t seem entirely apt to say that I enjoyed reading Hope and Other Dangerous Pursuits. It’s elegantly written, spare but not unnecessarily elliptical, suggestive and yet surprisingly detailed for a novel that’s less than 200 pages. This artistic care (and it does, somehow, strike me as a careful book, by which I mean painstaking, not cautious) is dedicated to such a quietly harrowing account of hopes turned back and diminished, though, that pleasure seems an uncomfortably voyeuristic response. Lalami explains on her website that the novel was inspired by stories she read about Moroccans attempting illegal crossings of the Strait of Gibraltar, hoping to begin a new life in Spain. The novel is artfully constructed, beginning with the crossing itself, introducing us to each of the four protagonists huddled with 25 other people in a 6-meter Zodiac. The pilot refuses to take them all the way to land; they are all tipped into the water and make their desperate way across the last stretch of water to the beach as best they can, only to face the unwelcoming realities that await them on shore. As we backtrack in the next part of the novel to learn how our four came to be in the boat, their watery struggle takes on retrospective symbolic significance: they have left home in the first place to avoid drowning of one kind or another. In tracing the very different lives of the four main characters up to the crossing and then picking them up again after the attempt, Lalami finds an effective formal device for conveying the variety and the human complexity of circumstances that drive people to such dangerously optimistic decisions. At the same time, in concentrating on just four stories she puts a human face on the pursuit too easily abstracted under terms like “illegal immigrants.” And though each of her stories is highly particular, both to the character she has imagined and to the social and historical context that is her focus, the hopes her people cherish–for opportunity, for freedom, for the dignity that comes with prosperity and independence–resonate because they are universal. Without belittling the families or the cultures they are choosing to leave behind, Lalami moves us to sympathize with her people because they look across the water and imagine something better. The saddest part of the novel, I thought, was its quiet concession to the elusiveness of that dream: hope is a dangerous pursuit, not just because of the risks of the pursuit itself, but because sometimes the chance you take brings you only further away from what you really wanted. Lovely post–and it makes me smile that you’re still enjoying the fruits of New York.